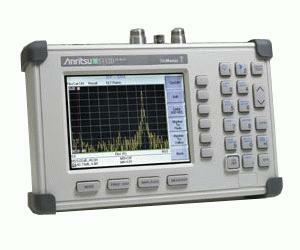 The Anritsu S332D spectrum analyzer is a wide band, very sensitive receiver. It works on the principle of "super-heterodyne receiver" to convert higher frequencies (normally ranging up to several 10s of GHz) to measurable quantities. The received frequency spectrum is slowly swept through a range of pre-selected frequencies, converting the selected frequency to a measurable DC level (usually logarithmic scale), and displaying the same on the CRT of the Anritsu S332D. The CRT displays received signal strength (y-axis) against frequency ( x-axis). Site Master S331D and S332D covering the 25 MHz to 4000 MHz are designed to accurately locate and identify RF cable feed-line and antenna system faults. These models are ideally suited for any experience level user in installing, commissioning, troubleshooting and maintaining today''''''s wireless systems infrastructures including VHF, broadcasting, paging, cellular, PCS/GSM, 3G, ISM, WLAN and WLL applications. The S332D features spectrum analysis capability and optional power meter capability in addition to Return Loss/SWR, Cable Loss and Distance-To-Fault (DTF) measurements, allowing field engineers and technicians the ability to easily identify and solve RF system problems such as coverage, interference, and other path related signal problems. S332D spectrum analysis ranges from 100 kHz to 3 GHz with one button measurements - Field Strength, Occupied Bandwidth (OBW), Channel Power, Adjacent Channel Power Ratio (ACPR), Interference Analysis and Carrier-to-Interference ratio (C/I).